WARSAW, Poland -- Russian aggression, radical Islamist terrorism, the refugee crisis, Brexit, Afghanistan. Ukrainian President Petro Poroshenko at the NATO summit in Warsaw, Poland, on July 9. Nolan Peterson reports that the NATO secretary-general said Russia must stop its “political, military and financial support for separatists” in eastern Ukraine. The list of challenges NATO leaders faced at the biennial summit in Warsaw, Poland, over the weekend was diverse, highlighting what some consider to be a post–Cold War moment of truth for the alliance to prove it still matters. “In the 70 years of NATO, we have perhaps never faced so many challenges at once,” Obama said. The alliance must reassure eastern members who are wary of Russian aggression while not antagonizing Russia into a back-and-forth of military one-upmanship. Meanwhile, many NATO states, particularly those in Western Europe, are feeling the domestic political pinch of the combined threat of radical Islamist terrorism and a wave of refugees from war-torn Middle Eastern states. “The Warsaw Summit comes at a defining moment in the history of our alliance,” NATO Secretary-General Jens Stoltenberg said Friday. The two-day NATO summit was held at Warsaw’s national stadium. Delegates and journalists from around the world filled the hallways, rubbing shoulders with world leaders and military officials. Journalists jockeyed for position at press conferences, afterward scrambling to the sprawling media center to file dispatches. The city was also on high alert. Warsaw’s streets were unusually quiet, long stretches sealed off for security reasons. Soldiers patrolled with weapons drawn. Friday, the sky roared with the sound of jet noise as NATO warplanes performed flybys for visiting leaders. Obama’s Saturday evening press conference drew by far the biggest audience. The summit’s largest press briefing venue was filled to capacity, with journalists standing huddled along the walls, craning their necks for a better view of the U.S. president while under the watchful eyes of the Secret Service. Obama was like a conductor before an orchestra—a cacophony of clicking camera shutters matched his every hand gesture as photojournalists hunted for the perfect shot. Obama commented on the Dallas shootings before he segued into the importance of NATO and the legacy of America’s commitment to defend Europe. “Generations of Americans have served here for our common security,” Obama said. He added: NATO is an example of a really enduring multilateral organization that helped us get through some really challenging times. There are fewer wars between states than ever before, and almost no wars between great powers. And that’s a great legacy of leadership in the U.S. and Europe and Asia after the end of World War II that built this international architecture that worked. Since 2014, the Islamic State militant group (ISIS) has attacked six NATO countries—the United States, Canada, Denmark, France, Belgium and Turkey. And plots have been thwarted in other NATO countries, including Germany and the United Kingdom. Yet despite the mounting threat, summit talks in Warsaw largely focused on responding to Russian aggression in Ukraine and the Russian threat to NATO’s eastern members. ISIS is a terror threat and does not pose an existential threat to any NATO member. Whereas Russia invading Estonia could mean the end of the country—literally. Hollande’s statement contrasted with the language other NATO leaders used regarding Russia, including British Prime Minister David Cameron. “The multinational spearhead force that we agreed to at the Wales summit [in September 2014] is now operational,” Cameron told reporters Saturday. The EU, NATO and the United Nations all have condemned Russia’s 2014 takeover of Ukraine’s Crimean peninsula as illegal. NATO also continues to condemn the ongoing flow of Russian troops and military hardware into eastern Ukraine to support separatist forces. This movement is a violation of the Minsk II cease-fire agreement, for which the EU maintains punitive economic sanctions against Moscow. Russia’s actions in Ukraine, along with a pattern of aggressive flybys by Russian warplanes in the Baltic Sea region, have left NATO’s eastern flank rattled. One of the summit’s key news items was the announcement that NATO will deploy four combat battalions to Poland, Estonia, Latvia and Lithuania on a rotational basis beginning next year. The battalions will be fielded by Canada, Germany, the United Kingdom and the United States. “NATO is as strong, as nimble and as ready as ever,” Obama said Saturday. “It is absurd to talk about any threat coming from Russia at a time when dozens of people are dying in the center of Europe and when hundreds of people are dying in the Middle East daily,” Dmitry Peskov, press secretary to Russian President Vladimir Putin, told reporters Friday, according to Reuters. An absurd situation would be if we forgot about the military actions against Georgia, and Ukraine in Crimea and Donbass, about Russia’s military engagement in Syria and about the incidents and provocations by Russian aircraft over the Baltic Sea. The main driver of NATO’s eastward pivot, and some say the alliance’s renewed post–Cold War purpose, has been Russia’s aggression in Ukraine. NATO’s 2014 summit in Wales came on the heels of Ukraine’s Maidan revolution and Russia’s annexation of the Crimean Peninsula. Two years later, Crimea is still in Russian hands, and Russia still supports separatist conflict in eastern Ukraine in which people die on an almost daily basis. “Two years on from Russia’s illegal actions in Ukraine, our message to Russia has not changed,” Cameron said Saturday. Reflecting this new reality is a push by some NATO leaders to increase military spending across the alliance. Out of 28 member countries, only five—the United States, the United Kingdom, Estonia, Greece and Poland—currently spend 2 percent or more of their gross domestic product on defense, an obligation agreed to during the summit in Wales. After many years, NATO has stopped the collective decline in defense spending. Over the past two years, most NATO members have halted cuts and begun investing more in defense. And this means defense spending across the alliance is now scheduled to increase. Ukraine is not a NATO member state, but a partner country to the alliance. NATO members therefore are not obligated to defend Ukraine militarily. Yet NATO has taken other steps to support Ukraine. In Warsaw, NATO leaders met with Ukrainian President Petro Poroshenko to outline a comprehensive assistance package to help Ukraine make key political reforms and modernize its military to meet NATO interoperability standards. The package also tags funds to help Ukraine counter the threat of improvised explosive devices on the battlefield, bolster its cybersecurity and rehabilitate wounded soldiers. 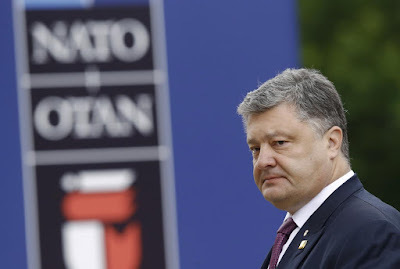 The Ukrainian president pointed to the historical significance of NATO’s holding its biennial summit in Warsaw 61 years after the creation of the Warsaw Pact, the collective defense treaty the USSR and Soviet satellite states signed in the Polish capital in 1955. “It is our common responsibility to change Russia’s aggressive behavior,” Poroshenko said. Stoltenberg said Russia must stop its “political, military and financial support for separatists” in eastern Ukraine. Stoltenberg made clear, however, that the question of Ukraine joining NATO as a full member was “not currently on the table,” and the alliance would address the issue of membership at a later stage. Stoltenberg added a thinly veiled warning against any Russian efforts to derail Ukraine’s budding NATO ties. “Every nation has the right to decide its own path,” the NATO leader said. In a prior blog the French Ambassador to Ukraine had stated how Ukraine was among France's top priorities. At that time I strongly interposed my doubts based on French deeds (as contrasted with diplomatic prattle). In fact, let me restate the point I made: France is simply not a reliable partner - not as a NATO ally (as in World War II it will "excuse" itself from any participation and leave the fighting and dying to others); nor as a source of unity in the face of a common European position. Hollande is about as good as it gets. Sarkozy and Le Pen can be trusted only to cave in the face of Russian economic "inducements" (such as they may be). The French still consider themselves (ever since de Gaulle) capable of an independent foreign policy. The Germans have managed to keep the French in line by crowning them with a formal (though not real) partnership status in dominating the EU. The British had always been Germany's real competitor, so Germany needed France if it was to rule the roost...which may explain Merkel's strong support for an early British exit). France had been a great nation with a great history, and an enormous contributor to world civilization and culture. They have lost their way ever since the French Revolution. Their military strength - unchallenged under Napoleon - had made it possible to lead an army to Moscow and burn it. Only the cold winter and their cockiness in failing to recognize the possibility of retreat under extremely adverse transport and logistical conditions (not unlike German cockiness at Stalingrad) had lead to their demise as a great power. It is most unfortunate. The Russians have long (quietly, among themselves) relished the thought of Russian boots marching under the Arc de' Triomphe. Who knows..given French naivete, everything is possible. UPDATE: Although the above critique of the French attitude towards Putin's Russia may sound a bit harsh and discordant after the tragedy that had unfolded in Nice, that tragedy, in fact, illustrates my point. Despite the many years during which it was obvious that the numbers of migrants entering France were becoming a serious problem for the French nation, they continued taking in and receiving more. Whole parts of French cities were abandoned to hostile migrants, because even the police were afraid to enter those areas. The epilogue to the "Camp of the Saints" was daily unfolding before the eyes of the French public while the government concerned itself with prosecuting Brigitte Bardot for bringing these outrages to the attention of the public. And still, people like Le Pen, Sarkozy, and now Hollande are wearing blinders - not only towards the migrant problem that the authorities have nurtured - but towards an even bigger terrorist - Vladimir Putin. The total number of his (known) victims number in the tens of thousands, including the innocent blood spilled in Chechniya, Georgia, and Ukraine. Putin is daily tightening the screws on his own citizens with new and draconic repressive laws intended to push back such limited freedom as Russia has enjoyed thus far. The oligarchic cabal is helping itself to whatever it wants from state budget and assets while people are getting by without food, heat, medicine. And yet....Hollande insists that the EU should be friends with Putin's Russia. This is the sort of naivete that has resulted in so many tragic, heart-breaking acts of terrorism in France: the naive belief that if one does nothing, or even helps feed and provide sanctuary to monsters, the problem will go away. Thank you George for not being indifferent. Several military experts and specialists have said that Russia would win NATO in the war if the war would break out between Russia and NATO. Petri: You make a good point, and I will address it. But first we should clear our minds of the myth of Russian military invincibility and prowess. I know of no war in the prior or current century that Russia has won by itself other than against tiny and weak opponents - not unlike a 700 pound Sumo wrestler "winning" by crushing a 100 pound opponent under his weight. Starting with the disastrous Russo-Japanese war; and continuing into its defeat in World War I; then its disastrous Russo-Finish war; then its scandalous collapse and surrender of millions of troops and much of its territory to the Germans before being rescued by western military intervention and massive aid in World War II; then its defeat in Afghanistan; then its two bloody wars against a tiny Chechniya of 1.3 million residents; then its invasion of tiny Georgia and its 16,000 troops. That is not to say that individual Russians lack courage, perseverance, or determination. But Russia's military performance has been greatly over-rated. The French had experienced this first-hand three centuries earlier when Russia lost the only battle it mounted against Napoleon at Borodino. Russia, however, excels in repression, control, and subversion. It has exceptional expertise in weakening its targeted quarries through disinformation, bribery, division, corruption, and intimidation; and, upon obtaining power, in installing and maintaining a system of surveillance and bloody brutality. That - more than its military threat - should concern the European members of NATO, particularly vulnerable countries like France, Italy, and Austria. As regards a near-term conflict between NATO and Russia, I agree with the military experts that -over the next year or two - Russia is well-positioned to threaten NATO and reconquer much of its "Warsaw Pact" domain because of European failure to maintain its military readiness. But the NATO member states are vastly superior to Russia in everything they would need to close that gap very quickly. Hollande's desired "friendship" with Russia should resume only when Russia can no longer threaten Europe. That is why, until NATO can check Russia's aggressive moves, it is so important to continue and increase sanctions on Russia and to support Ukraine both economically and militarily. Ukraine has the largest, most combat-ready and experienced force facing Russia, and, if Ukraine should fall, Russian military power and access to Europe (especially its soft Balkan underbelly) will be greatly enhanced. Upin- Thank you. It is always a pleasant surprise to discover thoughtful individuals "on the other side of the world" who take an interest in such a large variety of issues. It is particularly important that peace-loving people throughout the world not be taken in by sleek and very heavily budgeted Russian propaganda. It has enjoyed a status as a "super-power", but it can barely feed itself. It ranks 110 in longevity out of 180 countries in the world (because of poor medicine, poor hygiene, poor nourishment, and a great deal of alcohol). Its economy is heavily dependent on simple extraction and sale of natural resources, not unlike third world, underdeveloped countries. Have you ever seen a Russian-made consumer product that is competitive with that of other countries? For that matter, have you ever seen any Russian product? Although Russia reaches for the stars and lies astride 1/8 of the earth's land surface, indoor plumbing is still a rarity for a great many of its citizens outside the major cities and much of its rural areas look unchanged since the days of the Czars. Ukraine, unfortunately, is not much better off than Russia; but, at least, it is trying to free itself of 350 years of Russian rule and exploitation as well as 25 years of oligarchic corruption and wholesale theft. Its population and government is actively engaged and demanding a level of freedom, rule of law, and prosperity akin to that of Europe; while Russia is - once again - reverting to and stewing in its own sauces of chauvinism, militarism, repression, and blind subservience to its thuggish leaders. Putin's worst nightmare is to have a well-ordered, prosperous, self-confident, democratic Ukrainian state on Russia's borders because this would be a great source of unrest to his own, long-abused and deprived population.